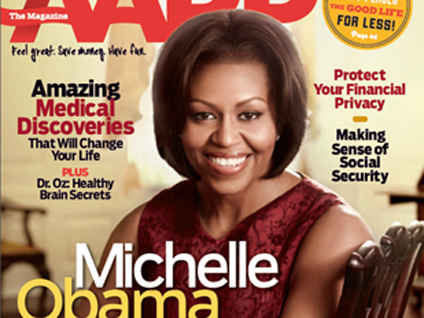 (CBS) First lady Michelle Obama appears on the cover of the September/October issue of AARP The Magazine. In it she talks about her future in politics, her reaction to Osama bin Laden's killing and what it's like to share President Barack Obama with the world. The first lady learned about the killing of Osama bin Laden moments before the rest of the nation. "I knew something was happening, but when it gets down to that level of secrecy, there's just a small number of people who know anything," she tells the magazine. "It was later in the evening, and Barack had his suit on, because he was going to the press conference. And I said, 'What's going on?'" She continues, "I was like 'Wow.' Then I wanted to know the details: 'How did it happen? Then what? And then what happened?' I was probably like every media person." One subject in which there is no secrecy surrounding Mrs. Obama is her political aspirations. "The answer is N-O. Period, dot," she tells the magazine. She also talks about one of the difficulties she has with her White House roles. "For me it's sharing my husband with the world," she says. "You get a little selfish sometimes. But every time I get irritated, or feel a little lonely or tired, I just think this is our duty. These men are doing a phenomenal service, and they're doing it with dignity and calm." Mrs. Obama recently appeared on the cover of Better Homes and Gardens, the first public on its cover in more than 40 years. In addition, she's the first female public figure to make the cover.